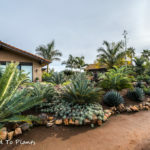 Agave albopilosa, Aloe pearsonii and other sneak-in plantings. 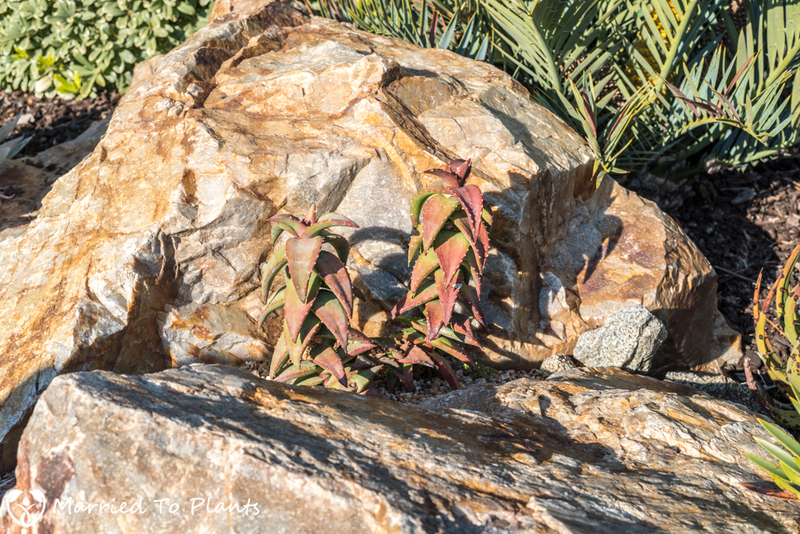 “Sneak-in” plantings? That is a term I use for any placement of a small plant into an unusual or random part of your garden. A place where most plants would fail or where one wouldn’t expect to see a plant. It is in these areas I like to place smaller-growing rare plants. 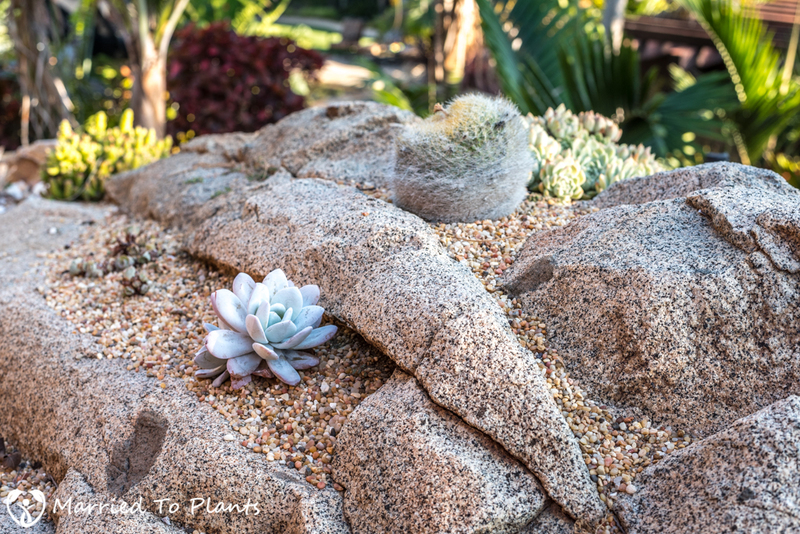 I find that these types of plantings make for excellent points of interest for fellow plant collectors. 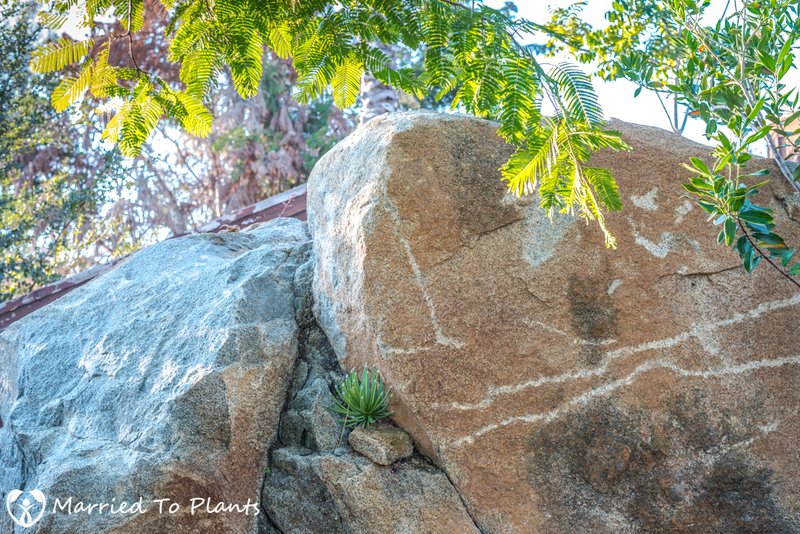 This blog post will show a few of my favorite “sneak-in” plantings in my garden. First up is Agave albopilosa. This agave has proven to be difficult to cultivate in the ground for me. I had three planted at one stage in my garden. One is now dead and another keeps getting a fungus on the leaves and is a very slow grower. The one that is doing the best? 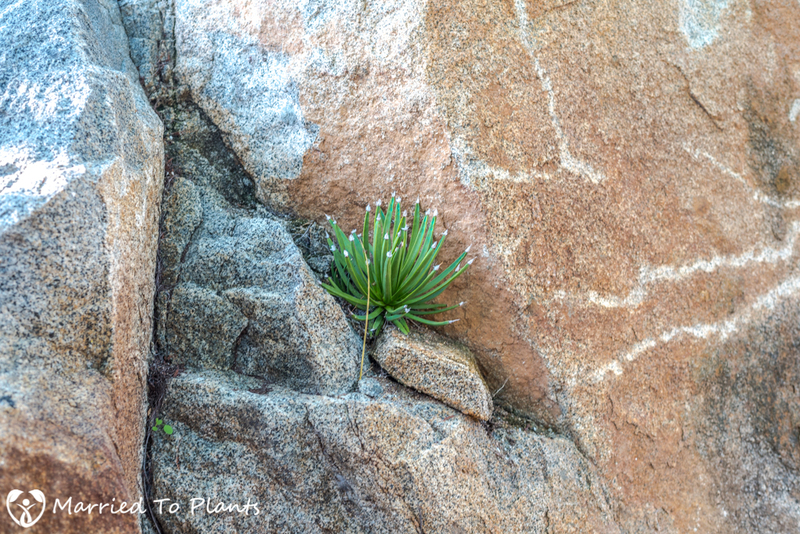 A sneak-in planting that I did in the crack of a boulder. I got the idea having seen photos of Agave albopilosa in habitat. They grow in a similar cliff-like setting in the Cañon de la Huasteca just outside of Monterrey, Mexico. 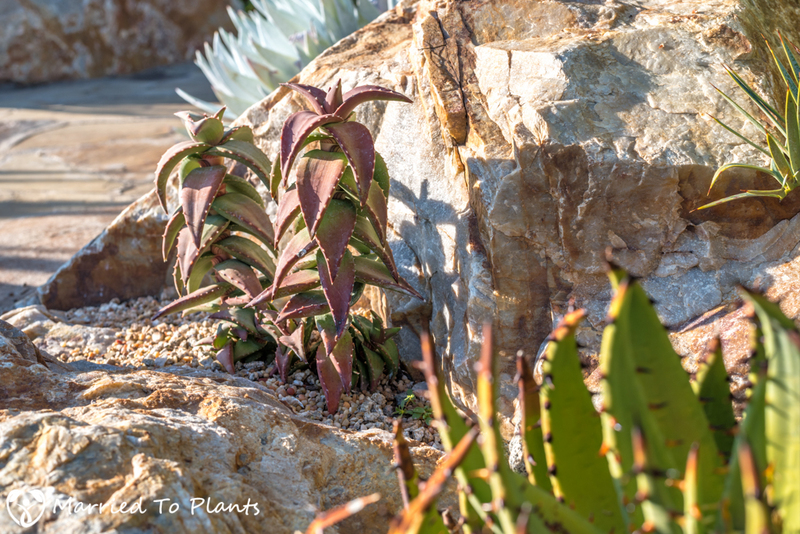 This Agave albopilosa was a very small plant when I put it in that rock crack. It has since grown very well over the last few years and is now opening up its famous snow-white tufts of fiber. 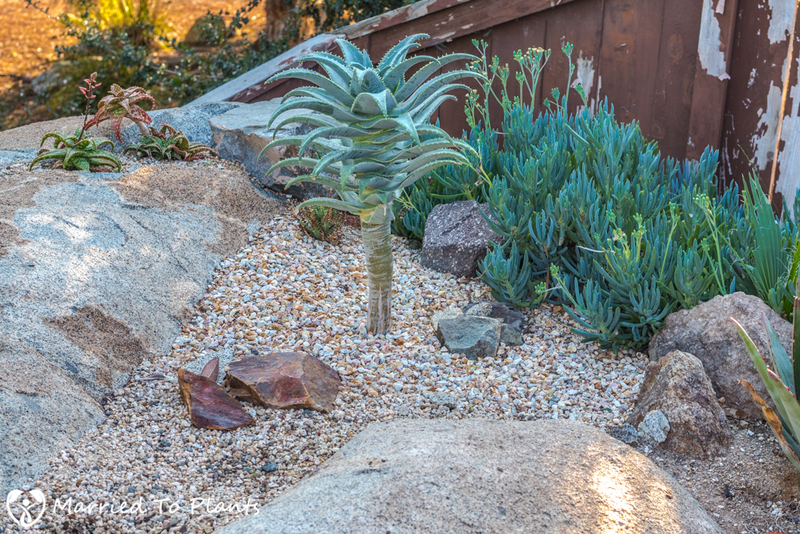 Another plant that can be a little tricky in the ground here in Southern California is Aloe pearsonii. Like Agave albopilosa, Aloe pearsonii is one of the slower-growing examples within its genus. 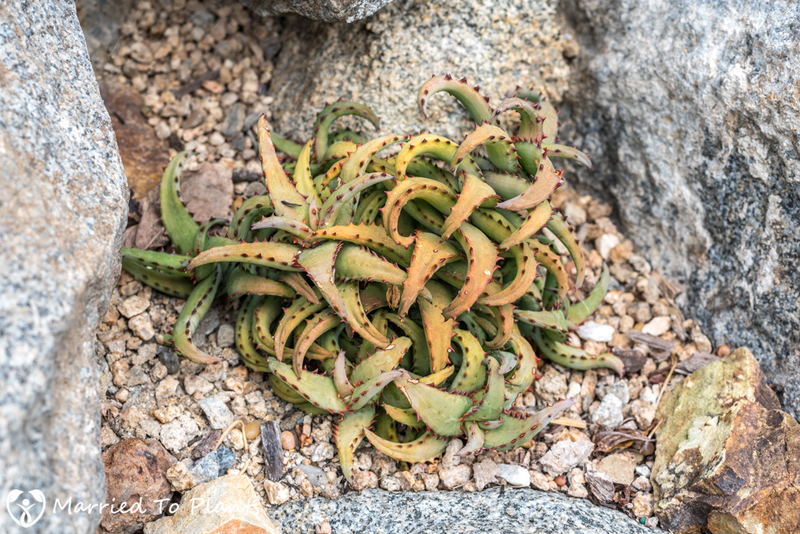 Found in habitat on the border of South Africa and Namibia, Aloe pearsonii comes from a very harsh and dry climate. Average rainfall is around 2-6 inches per year. That’s less than the 13 inches a year I get here at my Vista, California garden. 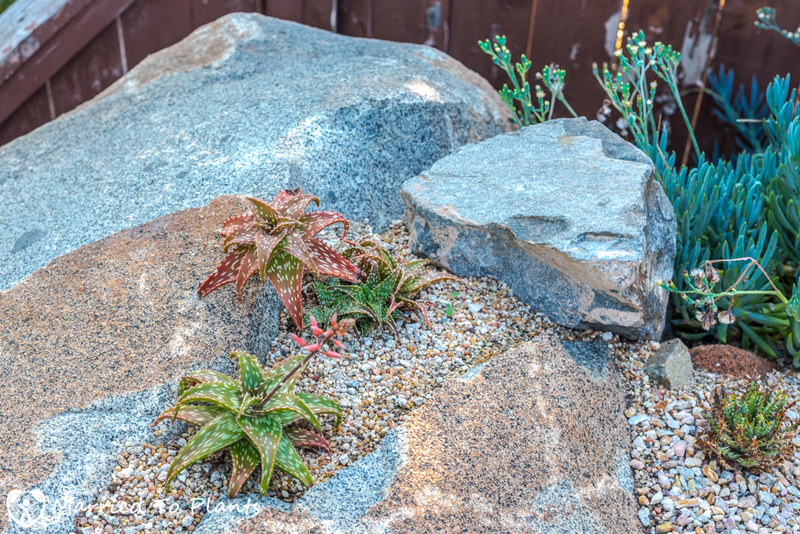 Sounds like the perfect plant for a small spot between two rocks in my garden that receives no supplemental irrigation. 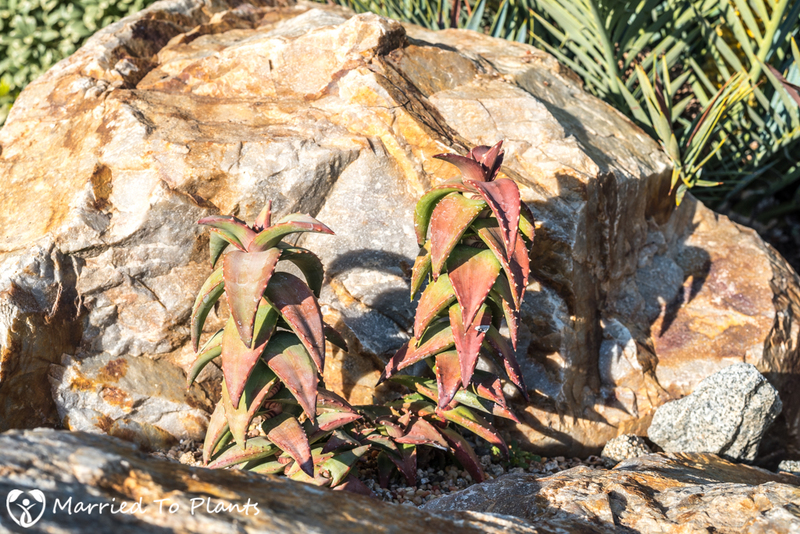 A stressed Aloe pearsonii has beautiful red leaves stacked all the way up its slender, clustering stems. Mine shown below has actually greened up a little thanks to a rare early-season rain we had a few weeks ago. Another great aloe that is slow-growing and one that can get lost in a landscape with its small size is Aloe castilloniae. 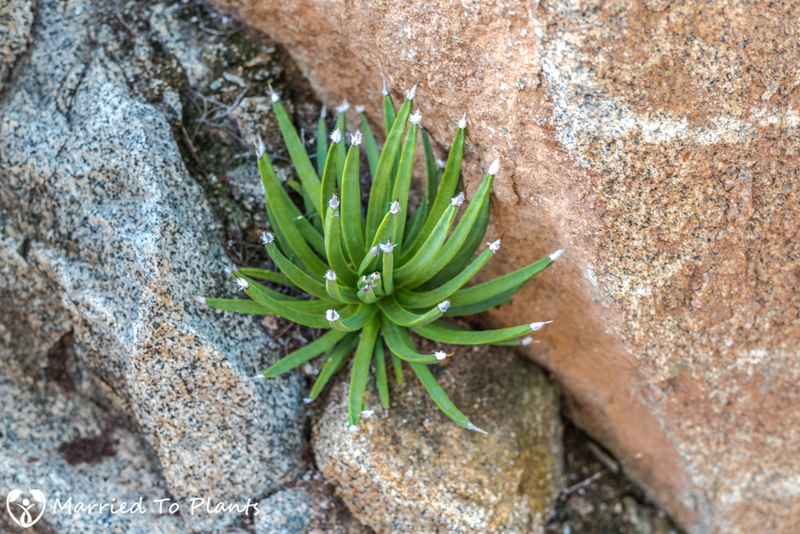 In native Madagascar, Aloe castilloniae is a cliff dweller that grows on free-draining calcareous sandstone. I had a great spot for it in a pocket of DG between a bunch of naturally stacked boulders. I added a little gypsum to make it feel more at home. 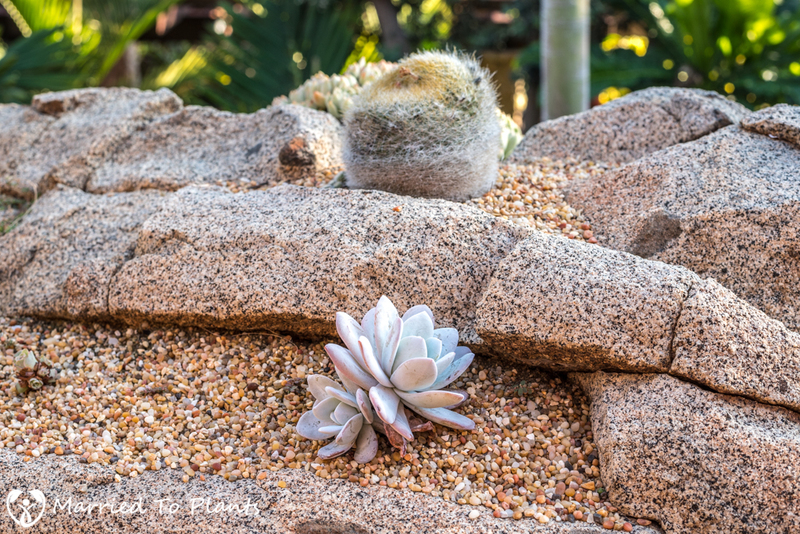 Keeping with aloes, Aloe squarrosa is another of the cliff dwellers that likes fast-draining soils. 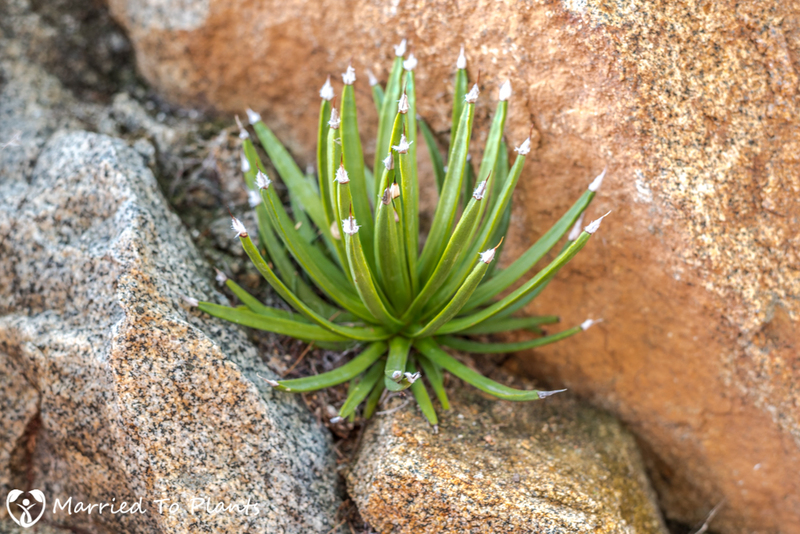 What you see in the pictures below is the true Aloe squarrosa. 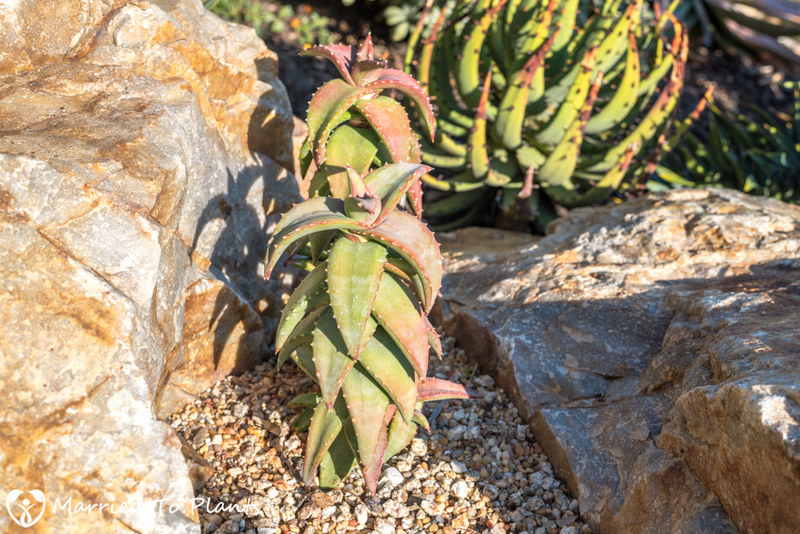 It is a much rarer and more attractive aloe than another plant that was also sold as Aloe squarrosa for many years – Aloe juvenna. 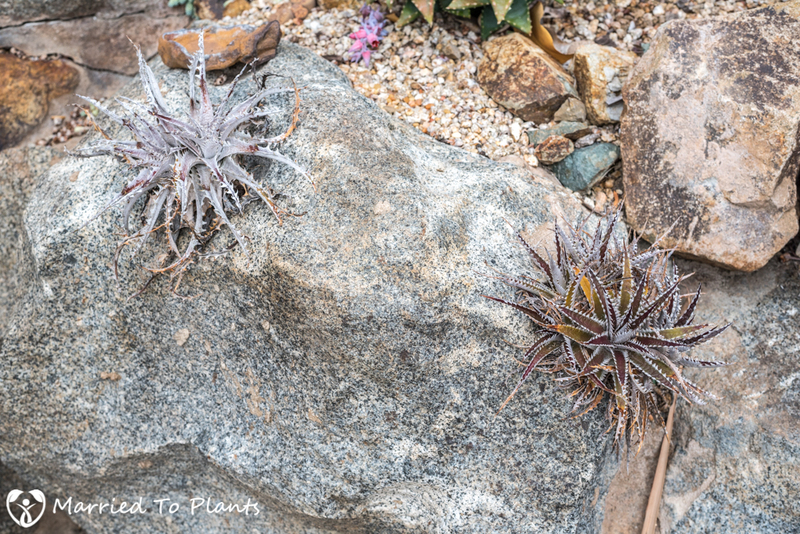 No clue how this happened, as not only do they look nothing alike, but Aloe squarrosa is from Socotra Island offshore of Yemen, and Aloe juvenna is from Kenya. 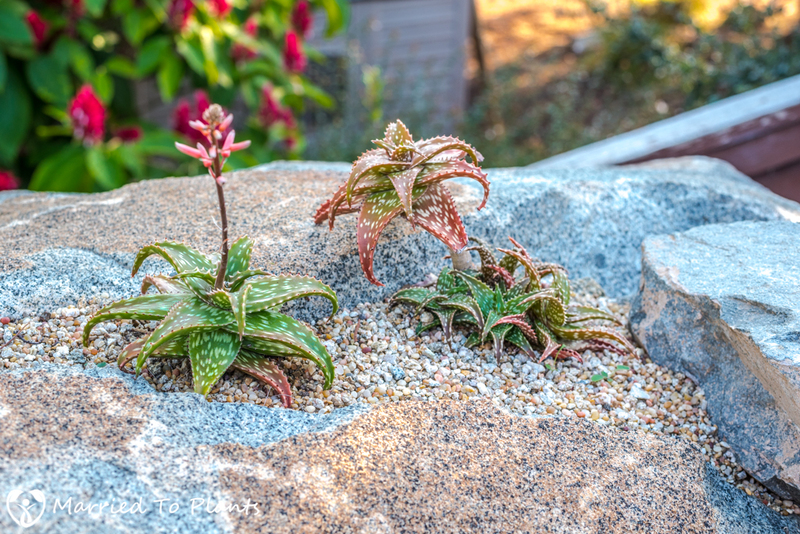 I planted my Aloe squarrosa in a spot that gets no supplemental irrigation and that will be perfect for it to crawl around on the rocks like you would find in habitat. Echeveria lauii is my favorite Echeveria. To me, no other Echeveria can match Echeveria lauii in beauty when well grown. 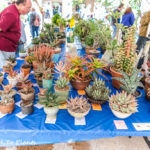 The issue is that it is very hard to grow Echeveria lauii well, especially outside in the ground in Southern California. 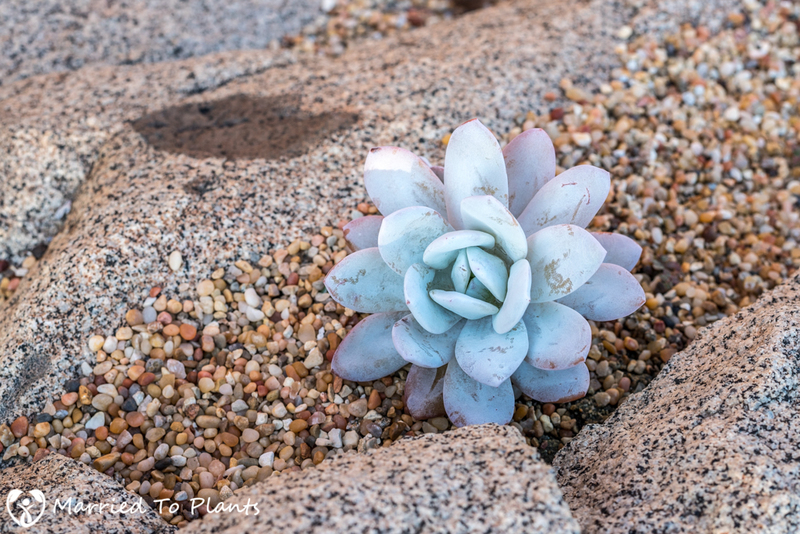 I hate to admit it, but I have killed about 10 of these challenging succulents. However, I think I might finally be safe with one, and of course it was placed in what I call a sneak-in planting spot. On top of a large boulder there was a small pocket with a crack in it. I put about an inch of DG in that pocket and added a thin layer of pebble. Three years ago I planted a very small seedling of Echeveria lauii just to see what would happen. Well, three years later it is pupping and looking pretty good, all things considered. Now if I can just stop the baby snails from making marks on it. 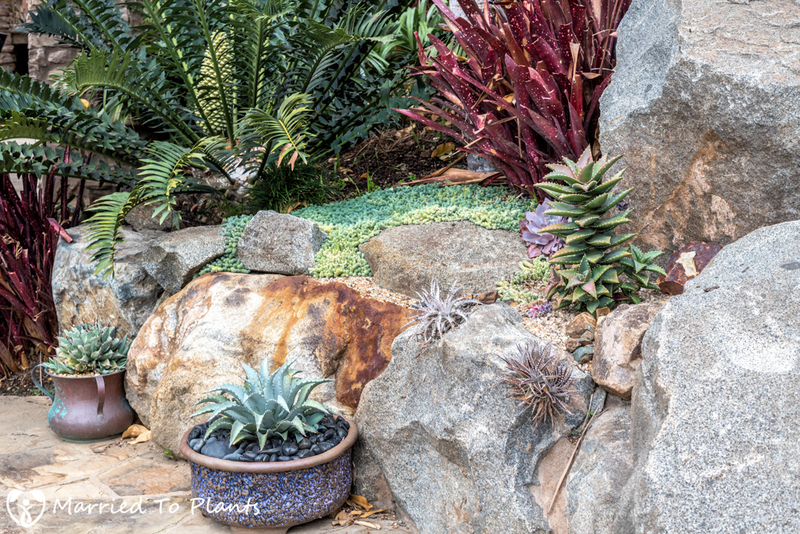 The final sneak-in planting I will write about comes from the world of bromeliads. Back when I was building my pool we had to drill and epoxy massive boulders to get them to crack apart so they could be dug out. It was a long process. One such rock was “test” drilled and retained two 3-inch-wide holes in it. It was an unnatural eye sore for many years to me. About four years ago I put two unknown Dickia in those holes. Both Dickia have rooted in well and are growing rather quickly after a few years of doing nothing. One even looks to defy gravity by sticking to the side of the boulder with no visible support. 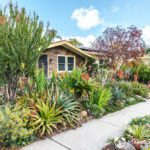 I have quite a few other sneak-in plantings but they are either still in the trial period or just never turned out as impressive to me as the ones I blogged about here. I get excited thinking about watching my successful ones grow over time. 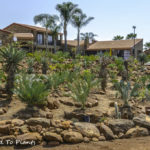 I can only imagine how amazing my Agave albopilosa will look 5-10 years down the road or how much my Aloe castilloniae will be snaking down the boulders it is planted between. 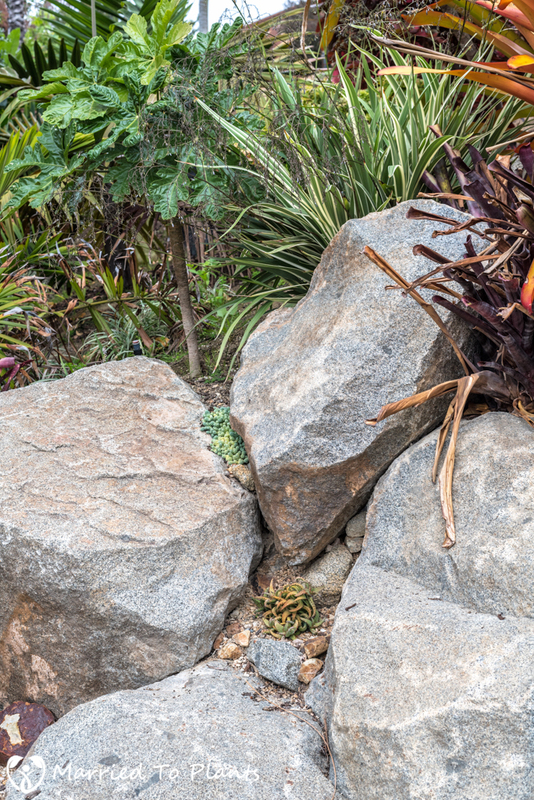 Your Aloe squarrosa is not. The usual confusion is between juvenna and squarrosa so you are correct in suggesting the confusion but your plant is not it either. It is a form of jucunda from ethiopia/somalia. squarrosa which grows on Socotra Island never flushes red like that. I have the plant and I have seen it on the cliffs of Milah in habitat. If you would like to grow the real one, Let me know. Thanks Kelly. Interesting. I got it from a very reliable source, but of course that doesn’t always mean much nowadays. Squarrosa and this form of Jucunda must be VERY closely related. I would love to see or get what you have as Squarrosa. I have an A. pearsonii which has been in a pot for about 10 years. It is finally coming into flower. Hopefully some seed will follow.